Registration for ISOJ 2019 is now closed as we’ve reached capacity, but live streaming will be available on isoj.org. 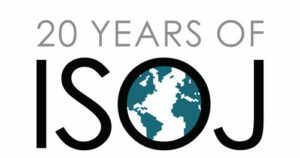 This year we will be celebrating the 20th anniversary of ISOJ, a unique global conference that brings together professional journalists, media executives, digital news innovators and academic researchers from around the world. We hope you’re joining us for this special commemorative event, which will take place April 12-13 at the University of Texas at Austin’s Blanton Museum of Art. On April 11, we’ll hold two pre-ISOJ events, which you can read more about and register for below. We’ll publish more details about this year’s program and speaker lineup on ISOJ.org in the coming weeks. In the meantime, sign up for our ISOJ newsletter, and follow us on Facebook and Twitter, for the latest updates. The registration fee includes access to all of the ISOJ sessions, breakfast at the Blanton, and snacks and coffee on both days. It also includes access to an ISOJ Happy Hour on Thursday evening, April 11, and a special reception at the Blanton Museum Atrium on Friday evening, April 12, immediately after the last ISOJ session of the day. The Knight Center for Journalism in the Americas, in partnership with the Knight Foundation and the International Women’s Media Foundation, will hold a day-long workshop, “Strategies to confront online violence: Female journalists cultivating resilience & building community.” The workshop will convene journalists, platform representatives, digital security experts, and other stakeholders to assess and respond to the risks that female journalists face online, and to support a culture of resilience and diversity in the news media. The day will culminate with a town hall session focused on solutions to the problem of online harassment. All ISOJ attendees are welcome to register here. This event has reached capacity and registration is now closed. However, a waitlist has been opened. The Texas Tribune and the Knight Center for Journalism in the Americas will be holding a pre-ISOJ hackathon centered on building tools to measure and boost trust in news. Attendees will form cross-disciplinary teams and, after a day of collaboration and coding, present their tool or concept to a panel of judges. Come for the chance to win our grand prize, but stay for the company of others at the intersection of journalism and technology. All ISOJ attendees are welcome to register for the event, which is designed for developers, designers, researchers, news junkies and more. Register here. We will share more details about each event in the coming weeks. In the meantime, we encourage you to register sooner than later, as space is limited. Reserved hotel blocks are now full, but you can find information about other nearby hotels — along with transportation and parking details — here. If you have questions about registration or accomodations, please email Mallary Tenore, Assistant Director of the Knight Center. We look forward to seeing you in April!